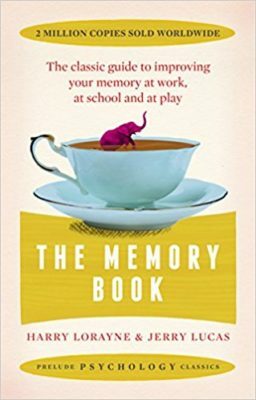 This book summary is part of an ongoing project to summarise ~30 books on Improving Your Memory - for more, see the full reading list. You frequently forget names of people you just met. Getting smart at anything is something you care about. You believe some people just aren’t born with good memories. All learning is some form of memorisation. And yet you may think you’re the kind of person who doesn’t have a good memory. And so you live your life, awkwardly forgetting the name of the person you just met, feeling foolish for not knowing last year’s basic figures when the CEO asks and able to count the number of important dates you remember from high school history on three fingers. And yet somehow you’ve also memorised tens of thousands of words in your native language, learned a ton of skills vital to everyday life and can still recall the name of your third grade English teacher despite not seeing them in decades. So here’s an idea: what if I told you that you could learn how to memorise any monologue in just minutes? Or that you are the kind of person who could have a near photographic memory? What if I said that all it would take was a little practice and patience; a few tricks and techniques to get your brain working at a level you never thought possible? That doing so wouldn’t just improve your memory, it would make you smarter while also bringing more opportunity, colour and meaning to your life? That is the reality Lorayne and Lucas’s Memory Book will help you find. If it sounds too good to be true, it isn’t. Let’s dig into their wisdom to learn more. The brain is very good at filtering and forgetting information. This keeps memory efficient but makes learning hard. We can use this to design tricks that sneak things past the brain’s bouncers. Once inside, we’ve bought valuable time to review and strengthen them before they’re forgotten. A small brain squeeze now saves time re-learning later. Was learning to drive worth the effort? Or would you rather have walked your whole life? The fundamental trick to sneaking things into memory is The Link Method – a powerful way to memorise long lists of things, fast. Take 2 minutes to try and memorise this list without any tricks. Now, without looking, try to recall it. How about backwards? Tricky right? Let’s try again with The Link Method. Action – Have one thing act on the other. A tree chasing a dog that has one of its sticks in its mouth. Go crazy – in fact, the crazier the better! What would your inner child imagine? Now, repeat the exercise for dog + helmet, helmet + apple and so on. This should take ~2 minutes. If the process feels difficult, don’t worry – it will get easier. Right now we’re just dusting off your imagination. Now, start with tree and use your mental images to help recall the list in order. Easy, right? Now, start with shoe and try it backwards. My bet is you may just surprise yourself. There is almost no limit to the power of the link method. Use it to memorise lists of 10 or 10 thousand items. The Link Method is powerful for two reasons. First, it forces you to become aware of, observe, focus on and effortfully associate two things. That’s vital because a main cause of forgetting isn’t forgetting, it’s not really trying to remember. Second, the vivid, surprising and/or humorous image you created fulfils all three criteria for entry to memory – it’s sensory, familiar and emotional. Things in a specific order. What about names, vocabulary, to-do lists and speeches? What of long-numbers, playing cards, dates, locations, sports or things stored and used out of sequence? I’m glad that you asked. Because now that we’ve mastered The Link Method, it’s time for substitution and encoding. Substitution and encoding upgrade The Link Method by solving both of its limitations. With a little thought, each system (or a combination of both) will let you apply The Link Method to anything. Let’s explore them in theory below and then run through some practical use-cases. The goal of substitution is to turn something abstract (something that can’t be visualised) into something concrete (something that can). Doing so, lets us use concrete things as placeholders for abstract things in The Link Method – extending your new found abilities. Greece → a “can of grease” or an “olive tree”. As you can see, substitution can be auditory (sounds like) or conceptual (reminds me of). The only important conditions are that your substitution is concrete and reminds you of the original concept. Hopefully, it’s obvious how easy it would be to now apply The Link Method to the names and order of these (and many more) countries. Encoding is really just substitution but without a direct auditory or conceptual link. We use The Phonetic Alphabet System to encode the 10 numerals as 10 different consonant sounds. The coding below (with some hints to help remember them) never changes. Why is this useful? Because this system lets you encode abstract numerals as concrete things. And concrete is just what we need for The Link Method. Remember: you’re encoding for sounds, not letters. Silent letters are disregarded (knee → 2). With these rules in mind we can work the system the other way too! Coming up with words or phrases that let you apply The Link Method. To practice, try playing with the system in everyday life. Make a game of changing numbers you see into their phonetic equivalents. Change the objects around you into numbers. When you find a tricky combination, treat it like a puzzle – have fun finding a memorable solution that fits. That may seem a lot of effort just to memorise long numbers but as we’ll see later, if phone numbers, dates, measurements, statistics or any other numerical data is an important part of your day, then the effort will be worth the reward. The Peg System is a pre-made collection of concrete things that code for numbers 1 to 100 (and beyond). N.B., Using The Phonetic Alphabet System as the base for your pegs makes learning them much easier. You’ll find plenty of suggestions for longer Peg lists online (as well as suggestions for 1 – 100 in The Memory Book). Personal, however, is always more memorable. That’s why the best Peg list will always use pegs that you choose on your own. Recall the position of any item. How? Simply link what you want to memorise to the relevant thing on your peg list and voila! Recalling the relevant peg item (in or out of order) will remind you of the relevant entry on your list. Meanwhile, recalling your item will remind you of your peg which will tell you it’s position. The final encoding system to look at is The Alphabet-Word System. Once again, you’ll find plenty of examples online to do this for both letter sounds and letter shapes (as well as suggestions for A through Z in The Memory Book). Once again, the best Alphabet-Word list will use your own words – just avoid overlaps with your Peg System or things get confusing. We’ll recap these in the section on Putting It All Into Practice. Adjectives play a very important role in classifying information you’ve learned. For example, German nouns have one of three genders – male, female, neuter. Normally a noun’s gender can be guessed with simple rules, but there are exceptions. According to these rules, Käse (Cheese) should be feminine (because of its e ending) but it’s actually masculine. Then, when using Substitution and The Link Method to learn the word, add an intense version of the adjective to your link. So for der (masculine) Käse (cheese) I might picture “a huge case o‘ (Käse) cheese (meaning)” and then set the whole thing on fire. This memorable image not only tells me the pronunciation and meaning of the word, it also lets me know it’s a masculine exception! You can apply The Adjective Idea to any information that needs tagging or grouping – from sports or financial statistics to people, anniversaries or art. As we’ll see later, it’s especially useful for counting playing cards where on-the-fly “mutilation” lets players track which cards are drawn or discarded. The techniques above will help you sneak information quickly into memory. But how do you keep it there? The answer is Spaced Repetition – reviewing information at increasingly long intervals to make sure you don’t forget it. In its most basic form, all you need to do is review any chains you want to keep 1 day after you’ve made them. If you remember the whole chain, review it again 3 days later, then a week later and so on, roughly doubling the time between reviews. If at any point you forget all or part of the chain, restrengthen it and start the process again from 1 day. These days, digital Spaced Repetition Systems can help you schedule thousands of refreshes exactly when needed to maximise staying power. Read this article on The Art of Memorisation and the Power of Spaced Repetition to learn more. Spaced Repetition refreshes your links as long as you need them. At first, the skills of linking, substitution and encoding may feel tricky to master. And memorising the Phonetic, Peg and Alphabet-Word systems will take some time and effort. But, with practice, the few seconds each step needs at first will become second-nature. And, once internalised, there is almost nothing these systems won’t let you better remember. Having a prodigious memory isn’t a super-power, it’s a skill – one that’s easier to learn than you think. The ways to make practical use of the systems above are limited only by your opportunity and imagination. ABSENTMINDEDNESS – Use The Link Method to connect an object with its location whenever you put something down. The benefits here come more from forcing awareness and observation than using an actual memory trick. ALPHANUMERIC CODES – Combine The Phonetic Alphabet System with The Alphabet-Word System to memorise alphanumeric codes (passwords, number plates, style numbers etc…) of any length, fast. ANNIVERSARIES – First, encode the date in 6 (YYMMDD) or 4 (MMDD) digits using The Phonetic Alphabet System. Now use The Link Method to connect it to the person it relates to. For extra points, use Substitution or The Adjective Idea to remind you of what type of anniversary it is. APPOINTMENTS – First encode days of the week in the numbers 1 – 7 and the hours of the day as 1 – 12 (Wednesday @ 11:00 → 311). Now link the appointment using The Phonetic Alphabet System (day and time) and Substitution (appointment content). AM and PM are mostly obvious from context (dentist @ 3 AM?) Use The Adjective Idea (e.g., light for AM vs. dark for PM) if you need to classify. :45 → a pie with one large slice gone. The worst that can happen is that you turn up a little early. ART – There are many different types of information you could learn about artists, art movements and artworks. Connect dates, artists, dimensions, styles, locations and more using all the systems available. If you’re curious about Art History, you might enjoy these 8,000 free flashcards from Phaidon’s 10,000 Years of Art. ERRANDS – Use The Link Method to connect objects to locations (or visual reminders, like knots in a piece of string). Before you leave the house, run through your intended destinations in your head to bring your links (and your errands) back into mind. FINANCIAL FIGURES – Use Substitution, The Phonetic Alphabet System to remember anything from stock tickers and prices to line items from a company’s financial statements. Use The Adjective Idea to help distinguish between types of information (e.g., revenue, operating profit and EBIT). HISTORICAL DATES – as per Anniversaries. LONG WORDS – Break them down and use Substitution. LONG-DIGIT NUMBERS – Use The Phonetic Alphabet System. MUSIC – Use The Alphabet-Word System or Substitution to remember basics like chord progressions. Replace notes with numbers on the keyboard or musical staff, then use The Phonetic Alphabet to remember long sequences as you would long-digit numbers. NAMES AND FACES – Use Substitution to make names familiar (e.g., Baldwin → bald one). Next, link them to an extreme image of a prominent feature on someone’s face (e.g., a very long nose, high cheekbones etc.). Like absentmindedness, the main benefit of this process is making you more aware, observant and conscious about remembering people’s names. We most often forget simply because we never tried to remember. For extra points, find a moment to write people’s names down with a few words of description next to their name. Chances are you will never need to refer to this list. Just the act of recalling a person’s name and some memorable feature of their face or your conversation will be enough to keep it in mind. And the worst case? You have a cheat sheet to go back to if you need it. PLAYING CARDS – If you want to apply your new memory skills to cards, you’ll first need to create and memorise a Card-Word System. Like The Peg System, the Card-Word System links each of a deck’s 52 cards to concrete things that can be easily pictured. You can either use an existing Card Word System (you’ll find plenty online, as well as in The Memory Book) or make your own. If you do make your own, read a few tips online about handling face cards first and be careful not to overlap with your Peg and Alphabet-Word systems. In any case, once your 52 card system is second nature, use the basic Link Method or Peg System to remember long sequences of playing cards both in and out of order. Tracking (or counting) cards is as simple as applying The Adjective Idea to “mutilate” cards as they surface. When you run through your list, you should find it easy to identify cards that are still in the wild. To count cards over several rounds simply rotate the form of mutilation to avoid getting confused (e.g., burning → freezing → exploding → cutting → back to burning). To remember cards that have been picked up by other players, use The Link Method to associate the card with a part of their body (e.g., their nose). This should let you keep track. POLITICS – From voting numbers and election outcomes to the names and jurisdictions of local representatives – there isn’t much that can’t be easily memorised with some combination of Substitution, The Phonetic Alphabet System or The Peg System. READING – See the sections here on different types of data (from names to dates and figures) to quickly memorise facts from any book. To memorise its entire structure and flow, first be sure to understand the point each paragraph is making. Now, pick one word (using Substitution if necessary) that will remind you of the whole idea. Finally, link this reminder to the one from the previous paragraph using The Link Method. Though this approach may slow you down initially, these techniques will become instinctual. With practice, your reading speed will bounce back. What’s more, you’ll now have the closest thing to a photographic memory you can get. SHOPPING LISTS – Use either the basic Link Method or The Peg System to remember long shopping lists both in or out of order. SPATIAL LOCATIONS – Combine your Peg System and Alphabet-Word systems to quickly and easily memorise approximate spatial locations using grid references. No grid on your map? Draw one. Label the horizontal x-axis with letters and the vertical y-axis with numbers. When you bury your treasure in grid A5, link an image of it to an ape (A) and a policeman (peg-5) and the safety of your booty is assured. SPEECHES – The best way to give a speech is never to memorise it word for word; it’s to talk fluidly in your own words from point to point. Once you’ve grasped this, memorising speeches is easy. For each point, pick one word (using Substitution if necessary) that will remind you of the whole idea. Now use either the basic Link Method or The Peg System to memorise your speech. You’ll have heard of the famous “Memory Palace” or “Method of Loci” used by the ancient Greeks to remember long speeches. To do so, they would link the points in their speeches to a place or a journey they knew well. This is exactly the same system. The only difference? We’ve dispatched with the need for Loci entirely. Each point (or Peg) becomes its own reminder for the next point in the sequence – no need for loci, no limitations on what you can memorise. SPORTS – See financial figures and politics. You can also memorise complex plays in sports like basketball, football and hockey by coding the play as a sequence of numbers and letters. To remember the right play at the right time, link it to the number, letter or codeword that triggers it. TELEPHONE NUMBERS – See long-digit numbers. THE ZODIAC – See anniversaries and historical dates. VOCABULARY – As with long words, the best way to memorise vocabulary is to break words into chunks. Next, use Substitution and The Link Method to connect pronunciation and meaning. This works as well for French as it does for Chinese. In fact, it works even better for languages like Chinese where symbols are made of collections of pictograms. So there you have it, the secrets to mastering memory – as used and perfected for millennia. If there’s one thing I hope you’ve taken away from today it’s this – anyone can vastly improve their memory with time, effort, patience and practice. So make your memory a priority, pick one part of your life that would benefit from a memory upgrade and get to work. Just remember: unless you suffer from a genuine medical condition, there is no biological excuse for having a bad memory. Memory champions aren’t born, they are made. Hey CJ, thanks for the feedback – I’m glad the crunch was useful! It’s definitely a fun and accessible book. And the exercises are so practical (and the improvements so immediate) that it really keeps you engaged as you read. I wish I’d read it when I was 11! Good luck! Read the book 40 years ago and still use the phonetic alphabet. Kids take to this very well. Thanks, John – glad you enjoyed it! Mnemonic techniques can feel like a chore to master but once you’ve got them – they serve you for life!